Well the shower was a success. Everyone had a great time. 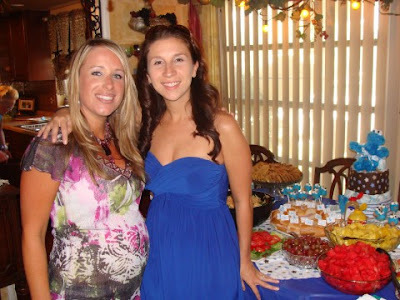 The food was delicious, the milk & cookies hit the spot and my girlfriend got lots of fun presents for her new baby boy! Here are some pics from the shower. Check out the cookie monster diaper cake & cake pops. Cute Diaper Cake... even the diaper's were themed to Sesame Street. Here are the cake pops. I took the recipe from Bakerella and created my own Cookie Monster design. I used blue chocolate for the outer layer, blue sprinkles for hair, marshmallows for eyes, and cookie crisp cereal for the mouth. I love the cookie monster pops! So cute!